American military signals intelligence satellite. ELINT satellite built by Lockheed for USAF, USA. Launched 1963 - 1964. Used P-11 bus. AKA: AAS;Hitch Hiker;LOGACS;SGLS;SRV. Status: Operational 1963. First Launch: 1963-03-18. Last Launch: 1989-08-08. Number: 54 . 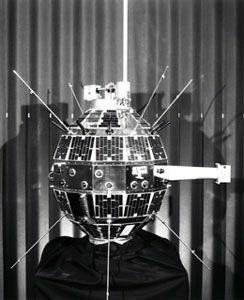 Subsatellite ferrets were a series of heavily classified small satellites, released in association with other military launches, that undertook radio and radar signals intelligence gathering. There seem to have been several types, but all details remain secret. Family: Medium earth orbit, SIGINT. Country: USA. Launch Vehicles: Titan, Atlas, Thor, Delta, Atlas SLV-3 Agena D, Thor SLV-2A Agena D, Atlas Agena D, Thorad SLV-2G Agena D, Space Shuttle, Thorad SLV-2H Agena D, Titan IIID, Titan 34D. Launch Sites: Cape Canaveral, Vandenberg, Vandenberg SLC1W, Vandenberg SLC1E, Vandenberg SLC2W, Vandenberg SLC3W, Vandenberg SLC4W, Vandenberg SLC4E, Cape Canaveral LC39B. Agency: USAF. Bibliography: 172, 2, 278, 279, 6, 11829.